Prolonged drought, recurrent floods and landslides hit hard in some areas of Thailand while other parts are affected to varying degrees. The main causes of these natural disasters include but are not limited to deforestation, water resources management, infrastructure for water reservoirs and drainage and increasing evidence of climate change. Scientists have high confidence that global temperatures will continue to rise and cause even greater impacts. To reduce losses and damages from these droughts and floods, Thailand has taken important steps in enhancing and expanding its integrated and sustainable water resource management practices. 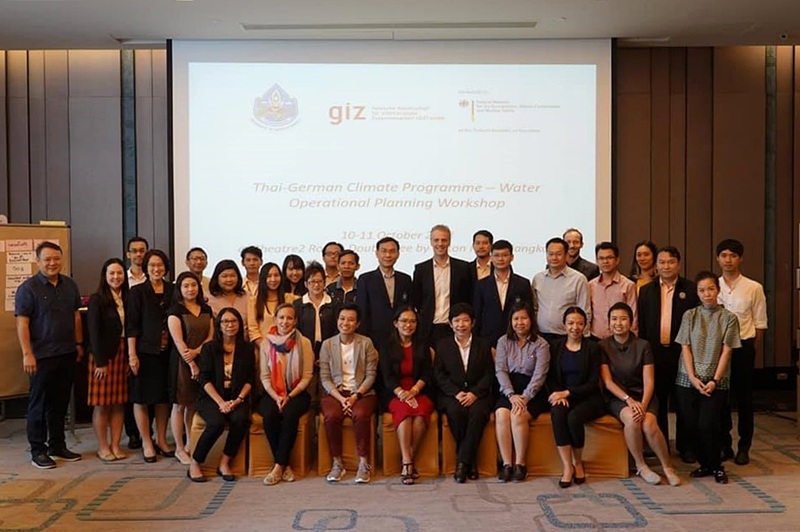 The Department of Water Resources and the Thai-German Climate Programme – Water component under Thai-German Climate Programme (TGCP) of GIZ Thailand recently held their first Operational Planning Workshop. The participating water-related agencies defined roles, responsibilities and main tasks. Capacity development strategies, pilot areas, risks and success factors were amongst the topics discussed and brainstormed. As a result, the two-day workshop saw the establishment of working groups and an activity plan. To move forward, a workshop on measuring reporting and verification and monitoring & evaluation workshops for improvement in water information and data management for adaptation was also held, followed by a pre-assessment site selection in Uthai Thani, Chachoengsao and Petchaburi provinces as part of climate resilient water resources management at the sub-national level.